Piso Fare 2019 Promos Until 2020: PIso Fare only to Dammam, Saudi Arabia! PIso Fare only to Dammam, Saudi Arabia! Just a 15 minute boat ride from the mainland, this picturesque island is famous for its white sand beach and towering lighthouse. Visit the lighthouse especially at night to get a glimpse of the Persian gulf and a spectacular view the beautifully lit city. Want to see this famous attraction in person? Fly with us to Dammam, Saudi Arabia starting October 4, 2014! See you onboard soon! Quoted DOMESTIC one way fares are inclusive of Base Fare, Php 120 Web Admin Fee, 12% VAT, Php 200 Terminal Fee for flights transiting in or exiting from Manila/Cebu Station and 7 kg hand-carry baggage allowance, but exclusive of Fuel Surcharge ranging from Php 250 - Php 450, Php 15 Aviation Security Fee for flights coming from Cebu and check–in baggage. Terminal Fees ranging fromPhp 50 – Php 200 for flights originating from non-Manila/non-Cebu Stations must be paid at the airport. Quoted INTERNATIONAL one way fares are inclusive of Base Fare, Php 120 Web Admin Fee, and 7 kg hand-carry baggage allowance but exclusive of International TerminalFees ranging from Php 550, Php 1,620 Philippine Travel Tax, Fuel Surcharge ranging from Php 2,160 – Php 5,400, Country Specific Taxes ranging from Php 430 – Php 2,195 and check-in baggage. Promo fares have limited availability and are non-refundable but rebookable subject to the following rebooking fees: Php 1,200 for Domestic destinations and Php 2,000 for Short-haul International destinations plus fare difference. Please note that booking fee rates range from Php 120 –Php 200 depending on purchase channel. For your convenience, flight changes, availing of prepaid baggage allowance for check-in baggage and web check-in service can be done up to 4-hours before scheduled flight. Piso Fare Promo 2015 for the month of peace! 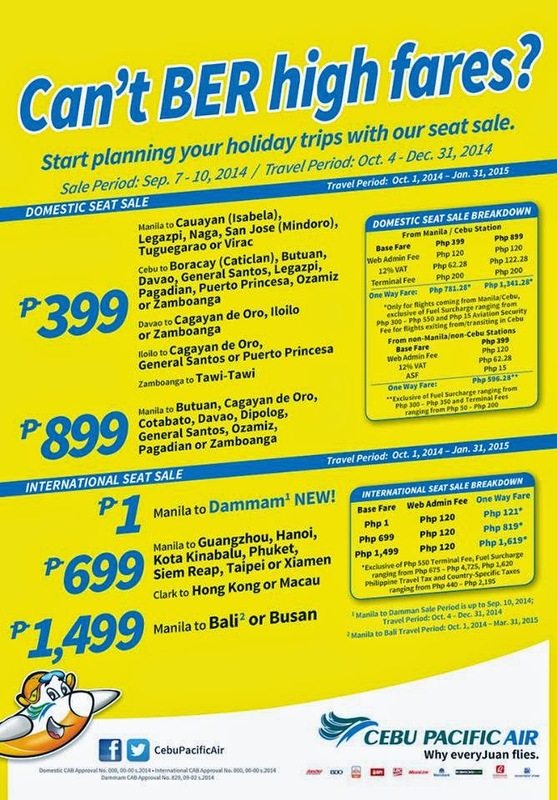 Piso Fare 2015 Promo for Boracay via Kalibo! Php 1 on Base Fare going to Kalibo, Boracay! Piso Fare Promo to Riyadh, Saudi Arabia is here!